WHAT'S UP THE PIKE: Springbrook High student dies in car crash on Bonifant Road Sunday night. Silver Spring may bustle like a city, but its location outside of the District makes it completely different to run a music club than one downtown, says Seth Hurwitz, owner of the 9:30 Club and It's My Party productions. In a phone interview with Just Up The Pike yesterday, the Bethesda-based promoter explained why he thinks it's high time the County reconsiders their plans to open a Fillmore music hall on Colesville Road with national promoter Live Nation - and what we might expect to hear from his club if it opens. "I would think they want all their options laid out for them," says Hurwitz of Ike Leggett's office, who soundly rejected his counter-proposal for the planned music club last week. 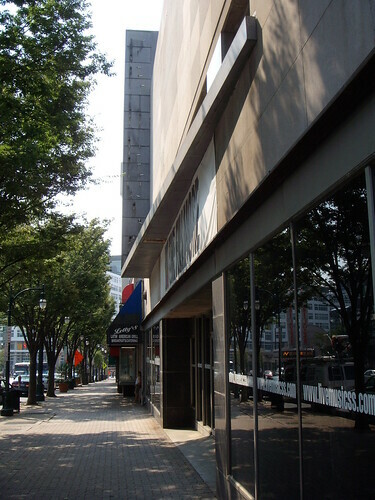 In exchange for a lower taxpayer subsidy, Hurwitz would lease the former J.C. Penney building for twice the rate currently offered by Live Nation. When Leggett turned him down, Hurwitz - along with communications director Audrey Schaefer and their lawyer - visited County Council members to present their case. "They all look at it and think ‘this is kind of a nobrainer,’ but we have to deal with Ike," Hurwitz states. "I haven’t met with one [councilmember] that looked at it and didn’t think it was a fantastic offer." Montgomery County has signed a letter of intent with international concert promoter Live Nation to open a Fillmore music club in the J.C. Penney building on Colesville Road. County Councilman George Leventhal (D-At Large) heard the I.M.P. proposal, but wants to reserve his judgment for later, he said in an e-mail. "The County Executive's position remains that negotiations with Live Nation have been concluded," says Leventhal. "I do not think that County Councilmembers should act like nine separate Directors of Economic Development and negotiate our own deals on behalf of the county." Leventhal, a Takoma Park resident, has been watching the process closely. "I was among those who were enthusiastic at the prospect of the Birchmere locating there and disappointed when that deal was not consummated," he laments. "I do not consider the case closed and have yet to commit my support to any agreement with any operator." Live Nation, currently slated to open a Fillmore music club in the contested space, has come under fire from residents of Downtown's surrounding neighborhoods concerned about concertgoers concerned overwhelming Downtown. The forced closing of a weekly go-go event at the Boys and Girls Club in Four Corners following neighborhood complaints suggests that whoever operates the venue would have a lot of community outreach to do. "We have a long history of 'if there’s a complaint from the community, we’ll call the meeting,'" Hurwitz says, noting that he only received two complaints from neighbors of last summer's Warped Tour stop at Merriweather Post Pavilion in Columbia - and took care of both of them. "I like to meet face-to-face and see what the issues are." Over the past few months, most local discussion has revolved around what kind of music the club would offer. Hurwitz' goal is to bring a different mix of acts than normally found at the 9:30 Club, he explains. "My idea is to just put the cream of the crop there . . . to put the kind of shows that we know are going to sell out," says Hurwitz. "More mainstream music than we’d have at the 9:30 Club. Just try to mix it up, give people a different place to go to." "Mainstream" offerings - which, depending on your musical tastes, could be a good or a bad thing - suggest a different crowd would be attending shows at a suburban club than at one in the District. At a blogger briefing earlier this fall, Ike Leggett expressed his interest in having a variety of genres represented at the new venue so to attract as many visitors as possible. "The only reasoning is that a lot of those [mainstream] acts is that 'They’re really good but people won’t go all the way downtown to see them'," says Hurwitz. "There certainly has to be a different demographic for Downtown Silver Spring than there is for D.C. and I’ll have to look into it." "All the bands that come through want to play the 9:30 and we’re bursting at the seams," he adds. "It’ll be pretty easy for me to take the people that we’re working with already and put them at a different location . . . it’ll be easy for me because I have the luxury of picking a venue to put them in." Having put on his first shows as a student at Churchill High in the early 1980's, Hurwitz feels more than confident that his track record should be enough to win the Council and local residents over. "It seems to be what I’m supposed to do in life," he says. "I like to entertain people. I like to walk around and watch people have a good time at a show. That’s what I like to do, more than watching the bands." "I want people to say a year after this opens, 'Wow, they did a really good job with this place.'" This does seem to be a repeat of some of the problems Duncan ran into when he leaped forward with his own ambitious plans to bring our community Mall America. It sounds great on paper but did not take into consideration local interests, concerns, and needs. Duncan "got it" after a huge outcry and did a good job of realigning development to community needs. In short, Silver Spring is not just real estate but a living, breathing group of people (many of them craftspeople, artists, musicians, dancers, cooks, and writers themselves) who create art and neighborliness as part and parcel of living. Musical venues are not interchangeable, and bigger in not necessarily better. Live Nation and the 9:30 club both deserve to be looked at. Both have something to offer but 9:30 club would serve us for far less tax payers' money and far more rent to the government. It has the advantage of being local. "Local" is what has grabbed the interest of our neighborhood -- we are an intensely active and concerned group of people who relish the unique flavor of our community we have and tend to support cultural institutions that jibe with our own concept of DC as an area with rich regional offerings that should be supported. This includes cultural infrastructure and institutions as well as artists and musicians themselves.